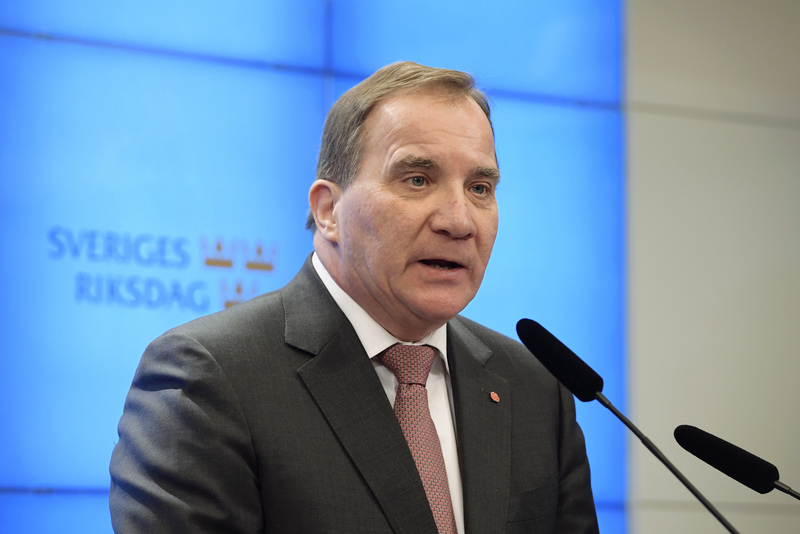 COPENHAGEN, Denmark (AP) — Caretaker Prime Minister Stefan Lofven of Sweden moved a step closer to forming a center-left governing coalition after a small left-wing party on Wednesday cleared the path for him to serve a second term. The move could end a four-month deadlock to form a coalition in Sweden. Two center-right parties already have agreed to abstain from voting against Lofven in Friday's ballot in parliament on whether he should be Sweden's next prime minister, leading a Social Democrat-led minority government likely with the left-leaning Greens. In Sweden, a prime minister can govern as long as there is no majority against him or her. Wednesday's development means three parties will abstain from voting against Lofven and two — his own Social Democrats and the Greens — will vote for him. This gives Lofven 195 lawmakers in the 349-seat Riksdagen, where a majority is 175 seats. Parliament Speaker Andreas Norlen on Wednesday nominated Lofven for Friday's vote, after which Lofven likely will present his government. Swedish politicians are trying to form a government without the Sweden Democrats, which has neo-Nazi roots. Both the center-left and the center-right blocs have refused to cooperate with the Sweden's third-largest party, which made great strides in the Sept. 9 national election. The emergence of Sweden Democrats, which has worked to moderate its image in past years, reflects how deeply Sweden is being transformed by migration. The largest of the Scandinavian countries, with 10 million people, has been welcoming to migrants and refugees for decades. Many Swedes have long cherished humanitarian values as a centerpiece of their national identity. In 2015, Sweden took in a record 163,000 migrants — the highest per capita of any European country. Since then, the country has sharply restricted immigration, but many Swedes complain that society cannot cope with integrating so many newcomers, many of them Muslims from Africa and the Middle East. The center-right opposition was left fuming by Wednesday's move. "It seems Sweden will get a new left-leaning government," said Ulf Kristersson, leader of the country's second-largest party, the Moderates, which now would be in opposition. "It is an absurd coalition, because the Center Party and the Liberals have been tricked into a government."